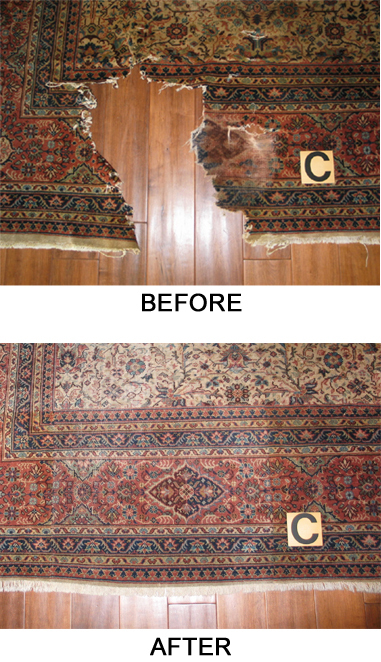 Since 1980 the repair workshop at Antique Rug Company has served Persian rug repair needs of its clients in Newport Beach. Call and bring your rugs in for inspection and advice. Pick up and delivery is also available throughout cities of Orange County including in zip codes 92603, 92625, 92657, 92659, 92661, 92663, 92617, 92651, 92658, 92660 and 92662. All handmade rugs are valuable works of art. Whether antique, old, vintage, collectible, family heirloom or new, handmade rugs should be properly maintained. Please see our RUG CARE section for easy tips to keep your rugs in good condition. Accidents happen and some cause rug damage. 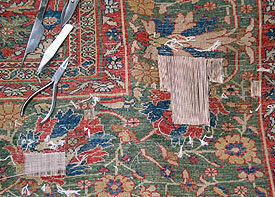 It is advisable to repair a damaged rug promptly and avoid other possible losses. 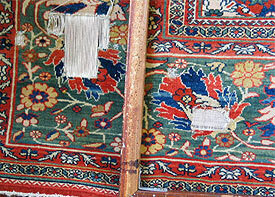 Our experienced restorers will examine your rug and show you options for repair or restoration. 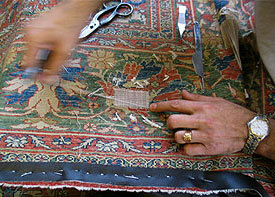 We repair all types of handmade and machine made area rugs — Oriental, Persian, Navajo, mechanical and other. See samples of our repair projects showing Before and After images at the link below.